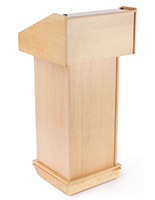 Our maple finish lecterns, while not constructed from solid wood, provide the look and feel of this highly valued lumber. Sometimes called sugar or hard rock maple, the species features a light cream color that can also take on a golden hue when applied with a clear finish. 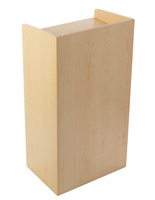 Maple is a hard and stable material that has been used for making furniture as well as a slew of other common products. Flooring is a common application, not only for residential construction but also basketball courts and bowling alleys. The wood carries sounds well and is used in many parts of musical instruments. Add in baseball bats, butcher blocks, and pool cues and you can see the diversity of its applications! 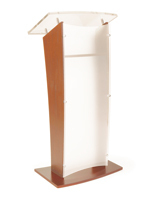 This collection of maple finish lecterns features solid models with internal storage and designs with acrylic front panels. 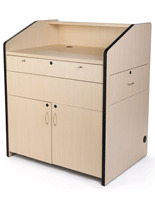 The solid styles are manufactured with plastic laminate over a particle board substrate. 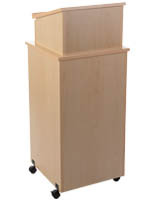 The material is very forgiving with a durable surface and scratch-resistance. 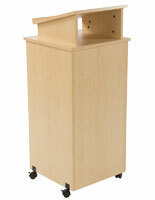 In addition to being used as podiums for speaking events, these maple finish lecterns make excellent hostess stations. 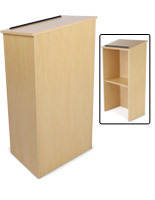 Affordably priced, they are shipped flat and require simple assembly. 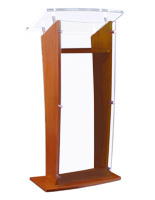 The lecterns with acrylic panels come fully assembled. Combining clear or frosted panels with aluminum standoff mounting fasteners provides a handsome overall design that looks great with the maple finish of the wood. These can be purchased blank or with a custom-applied logo. 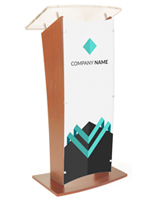 Add the name of your business or school, or the logo from your church or hotel, for a truly personalized presentation that projects professionalism. We offer this service as computer-cut vinyl sign graphics with up to two different colors. 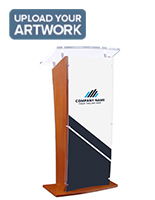 Send us your custom artwork (must be vector graphics) and we will apply the logo to the acrylic panel before shipment, ready to use right out of the box.